The National Shooting Sports Foundation® (NSSF®) announced today that it has been awarded a two-year, $2.4 million grant by the U.S. Department of Justice (DOJ). 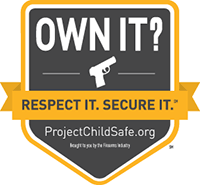 Funds will go toward providing firearm safety education messaging and free gun locks through NSSF’s Project ChildSafe program to communities throughout the country, to encourage responsible firearm storage and help reduce firearm accidents, theft and misuse. The grant award is a strong endorsement of the effectiveness of programs like Project ChildSafe, which since 1999 has distributed more than 37 million free firearm safety kits across the country and in five U.S. territories. Thousands of law enforcement agencies, hunting and conservation groups, and firearms retailers already participate in Project ChildSafe and have been instrumental in expanding the reach of the program’s safety messages. The new grant from DOJ will likewise be instrumental in making even more free gun locks available to more gun owners nationwide.